What if being a conventional nurse isn't for you? The growth of the medical industry means that you can find a career in whatever area that interests you. Are you organized and detail oriented? Check out the medical assistant and surgical technician positions. Do you live for uncovering hidden clues? 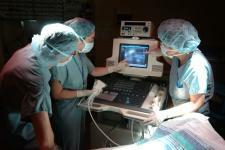 You might enjoy being an ultrasound technician or radiological technician. You know you want to make a difference in people's lives. But, what if being a conventional nurse isn't for you? What if you want to be a little different? The growth of the medical industry means that you can find a career in whatever area that interests you. Some of the careers listed in this section are very similar to straight nursing positions, while other careers call on other skill sets. Are you organized and detail oriented? Check out the medical assistant and surgical technician positions. Do you live for uncovering hidden clues? You might enjoy being an ultrasound technician or radiological technician. Most of these careers require up to two years in a trade school or community college. However, as the medical industry grows, it is becoming more important for each person to handle a greater degree of responsibility, so employers prefer to hire graduates with bachelor's degrees when possible. Some medical career schools will offer special programs for further degrees if you have already earned your associate's degree and licensure in your specialty. As an assistant or technician, you will find positions in traditional locations such as hospitals, assisted living facilities, and clinics; as well as private laboratories, universities, and anywhere else that needs a specialist. Technicians work under the supervision of nurses, doctors, and lead technologists, but often have a chance to focus their work to their own talents. Find a medical career school near you and start today! There is currently a high demand for nurses with doctoral degrees, and the need isn't expected to decrease in the near future. A PhD in nursing will prepare you to run research projects, have your own practice, or manage other nurses. It will take you four to six years of intensive coursework and internships. Before you start on your doctoral program, it is important to find a faculty mentor and decide what area you would like to specialize in, whether it be research, pediatrics, or any other medical specialty. Do you enjoy working with people and solving health problems? If you have a keen interest in caring for patients, health and wellness, and want to help people recover from injury and disease, a career as a nursing practitioner could be a strong fit for you. Patients need an empathetic and well-trained nurse to help them through the critical stages of illness and treatment, and you can help restore them back to good health as a nurse practitioner (NP). People don't only need nursing help when they are in a hospital; some need constant help at home, too. As a home health care nurse you will provide direct care and treatment to patients in their homes. Home nursing is another subset of nurse practitioners. Since home nurses work with little supervision, you will be required to maintain administrative documentation. Your patients will rely on you to take note of any minor health change and to support them physically as well as emotionally. As a parish nurse, you will blend your medical knowledge with your spiritual beliefs. Central to a parish nurse's work is the idea that faith is important to total healing. Parish nurses do not simply rely on prayer, but rather believe that a patient's spiritual strength will support them through the medical tests and treatments they face. It is your responsibility as a parish nurse to help the patient understand the medical side, and comfort them through the spiritual side. Rather than working in a hospital, as a parish nurse, your healing skills will be around a specific congregation or community. Do you feel the road calling? You might enjoy being a traveling nurse. Do you enjoy working with older people? Geriatric Nursing is a field that continues to grow as our population ages. A geriatric nurse is a nurse practitioner that, similar to a clinical nurse, has continued their education, but focused it on adults over retirement age. You will help patients manage their physical and emotional needs. Not all nursing relies on physical tests and treatments. Patients with psychiatric, mental, emotional, or behaviorial problems need nurses, too. Psychiatric nurses are another sub-set of nurse practitioners. As a psychiatric nurse you will work with patients on treatment plans, long-term care, and education and support. You will be able to find work in assisted-living facilities, community outreach centers, and hospitals. If you feel called to work in a specific area of medicine, you might want to consider becoming a Clinical Nurse Specialist (CNS). As a CNS (as with nurse practitioners), you can work in hospitals, assisted-care facilities, homes, or even have your own practice. However, unlike nurse practitioners, you will only work in the specialty field you chose, be it pediatrics, nephrology, or the emergency room. Do you get excited about working with babies? As a neonatal nurse, you will work with both healthy and chronically ill infants at hospitals, clinics, and other settings. To become a neonatal nurse, you must first pass your nurse practitioner classes and then take additional classes on infant medical treatments and on training new parents how to care for their children. If you are self-reliant, you might want to look into becoming a nurse practitioner. Similar to clinical nurse specialists, nurse practitioners have advanced, master's-level education. As an NP, you will learn how to diagnose common ailments, perform routine tests, prescribe medication, and work closely with patients to meet their health needs. Nurse practitioners can have their own practice, or work in hospitals and assisted-living facilities. Legal nurse consultants are nurses who offer medical information and testimony to lawyers. You normally move on to becoming a consultant after working in a specialized area of nursing such as operations, pediatrics, or physical therapy. If you can stay organized when work is pulling you four different ways at once, you would make a perfect medical assistant. As a medical assistant you will work in a doctor's office or hospital where you will manage files, coordinate schedules, handle the bookkeeping, aide doctors in routine exams, and pretty much do everything that needs doing. Sounds a bit stressful? You can take charge and manage it like no one else. Were you the kid who always wanted to know how things were made? If so, then you should consider a career as a medical lab technician. This isn't a career for the squeamish. You will be handling blood and other bodily fluids. But, if blood and needles don't scare you, you'll find a career that rewards you by helping countless patients keep track of their health. Television hospital dramas often show the operating room clean and prepared with every instrument. But, in reality, who is in charge of ensuring that operations go off without a hitch? That person would be the surgical technician. If you are the type of person who is interested in working in the medical field and believes that it is always best to be organized, this may be the position for you. If you want to spend more time with patients than paperwork, consider a career as a patient care technician. Sometimes called a nursing assistant, sometimes called a patient care technician, the position calls for people who can balance complicated medical requests and patients who might be scared or confused. You will work under the supervision of a registered nurse or doctor in a hospital, assisted-living facility, clinic, or home. When you hear ultrasound technician (also known as sonographer or ultrasonographer), you might first think of babies. And you would be right. But as an ultrasound technician, you would also have the opportunity to aide doctors in discovering cancer, heart disease, and other life-threatening illnesses in patients. Radiological technicians, also known as X-ray technicians or imaging technicians, help doctors by taking images of broken bones and other internal injuries. Radiological technicians prepare patients and operate the machinery in hospitals and clinics.